Asa Gray, preeminent American botanist and Harvard professor, was born on November 18, 1810 in Sauquoit, New York. Born in upstate New York, Gray attended Fairfield Academy where he studied natural science under James Hadley. At the age of 17 he read an article on botany in Brewster’s Edinburgh Encyclopedia and bought Amos Eaton’s Manual of Botany. These tomes inspired him to journey into the woods, where he collected a plant specimen and correctly identified it using Eaton’s Manual. This ignited an urge to collect. Gray received his M.D. from Fairfield in 1831, however he decided to pursue his passion instead and spent the next 11 years traveling across New York, Pennsylvania, and New Jersey collecting specimens. This led to the publication of North American Gramineae and Cyperaceae. He published Elements of Botany in 1836, a text that favored a deep understanding of plants instead of strict classification. He accepted a professorship at the newly-created University of Michigan, and published the Botanical Textbook in 1842. Later that year, Gray moved to Cambridge to teach at Harvard. He cultivated the institution’s department of botany, and his home, located in the Harvard Botanical Garden, became an area of study visited by students and international scientists alike. Gray was a pioneer in the study of plant geography, and focused on the similarity between plants in Japan and New England. This broad scope, along with his foreign correspondences, led him to the work of Darwin, whom Gray championed. He was an ardent supporter of Darwin’s theories of evolution and The Origin of Species. On Gray’s 75th birthday, 180 American botanists sent him congratulatory letters and presented him with a silver vase embossed with images of the plants associated with Gray’s legacy. He died in Cambridge after suffering a stroke. His final correspondence with a fellow botanist included a gentle criticism of that botanist’s choice of a superfluous plant name. 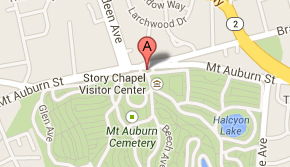 Asa Gray is buried at Mount Auburn in Lot 3904 on Holly Path where a Japanese Maple tree stands above his monument. Adapted from the research of Judy Jackson as published in Mount Auburn’s Person of the Week: Asa Gray, 1998. Nice article! Gray was also publishing in American scientific journals and corresponding with American scientific societies. He pioneered work in the filed of American biogeography. His botany book is still popular!